Gas Turbines - Energy Deployment Co. Ltd.
We can provide you access to the best gas turbine products and services from Europe and Middle East. These include new power plants, spare parts; refurbish units, repairs and overhauling as well as maintenance. From customer-supplied samples, we can reverse engineer and generate all necessary technical data and specifications to manufacture your replacement spare parts. Reverse engineering can save you precious time and money. 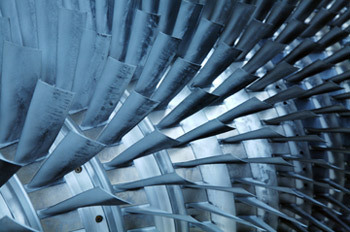 We supply new parts for Gas Turbines including fuel nozzles, brush seals, flow dividers, blades and special components. We also undertake repair fuel nozzles, flame scanners, servo valves, check valves, fuel pumps, flow dividers, spark plugs, fuel regulators, stop valves, combustion liners and transition pieces. We can assist you during a breakdown providing you with faster service than OEM suppliers with our competent partners who also can undertake major overhauls, preventive measures, cost-efficient maintenance and upkeep. We can offer you turbine cleaning services by CO2 Dry Ice Blasting process that requires no disassembly of equipment or Fixtures, no rinsing and no re-greasing. Repairs of gas turbine rotors including the reconditioning of the bearing area, reblading, balancing and more can be carried out quickly and efficiently. We help in component repairs and manufacture as well as training and retrofits.